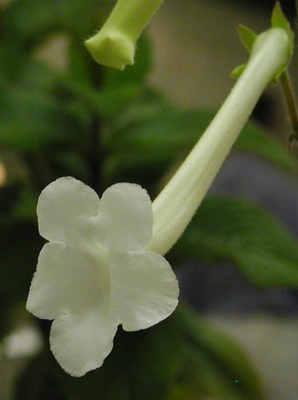 Like many other sweetly-scented gesneriads, Streptocarpus vandeleurii has pale flowers, enhancing visibility at night. Pollination by bees is the most frequent pollination type in the Gesneriaceae. The flowers provide nectar or pollen as floral rewards and are mostly without fragrance (see previous page for a section on Fragrance). Bee flowers are broad-tubed, infundibuliform or campanulate, with a wide open mouth (gullet or bell flowers) and of light color (white, blue, violet, yellow in various shades and combinations). Personate flowers (mouth closed by a vault of the palate) are rare. Examples include Rhynchoglossum, Didymocarpus antirrhinoides and D. corchorifolius. Pollen deposition is mostly on the head or back of the insect. In Drymonia serrulata, glandular trichomes inside the corolla secrete an oil which is deposited on the anthers and transferred to the thorax of visiting bees, facilitating pollen adhesion (Steiner, 1985). The remarkable “salt-shaker”mechanism of the coherent anthers of Drymonia is described under Floral Structure. In the pollination of Gesneriaceae a wide range of bees are involved. The dominant group is the Apidae, from which family the euglossine bees (tribe Euglossini, an exclusively neotropical group of bees related to bumble bees) play an important role in the neotropics. The Apidae-Anthophorini and the Apidae-Xylocopini may also have some significance. Regarding the pollination by euglossines, two different pollination syndromes must be distinguished. These are associated with flowers providing either nectar or perfume as a floral reward. Non-euglossine-pollinated bee flowers. Bee flowers prevail by far in the Old World Gesneriaceae. However, very little is known about which bee species are the actual pollinators. There are few detailed field studies, and even casual observations are very rare. Actual buzz pollination by Amegilla bees (Apidae-Anthophorini) has been documented in Saintpaulia species (Martins 2008: see the pollination chapter of “Saintpaulia — the African Violet”). Throughout this group, the floral structure suggests that the collected rewards are nectar and/or pollen. With its pale color and fimbriate corolla, Paradrymonia ciliosa is typical of nectar flowers catering to euglossine bees. Euglossine-pollinated nectar flowers. Both male and female euglossines visit the flowers in search of nectar. The corolla is relatively large, broad-tubed, the limb is subregular, with rounded lobes, color is light (white, light yellow or rose), and a nectary and nectar are present. The frequently encountered “episcioid” flower (which apparently evolved independently in several neotropical genera such as Episcia, Drymonia, Nautliocalyx, Paradrymonia etc.) may represent a special subtype of the general bee pollination syndrome: color white or whitish, corolla lobes conspicuously dentate or fimbriate, corolla tube with a dorsal sac or blunt spur at the base. Euglossine-pollinated perfume flowers. This flower type is more specialized and exclusively addressed to male euglossine bees. 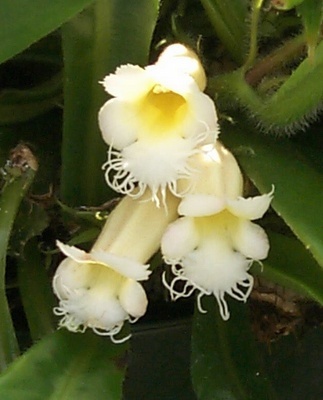 They collect the fragrance compounds produced by the osmophore (see “Perfume Flowers” above). The perfume is used by the male bees to mark the swarm areas and to attract female bees. Outside Gesneriaceae this pollination type is known from numerous orchids, and some genera of Solanaceae, Araceae and Euphorbiaceae. Sinningia tubiflora has pale flowers with a long corolla tube and sweet scent characteristic of many species pollinated by night-flying moths with soda-straw-like tongues. In general, flowers pollinated by butterflies provide nectar as a floral reward, have a hypocrateriform corolla (with a long, narrow tube and a flat limb) and exhibit red or blue flower colors. These characters apply to some species of Achimenes. From this it may be inferred that they are pollinated by butterflies, but factual evidence is lacking so far. 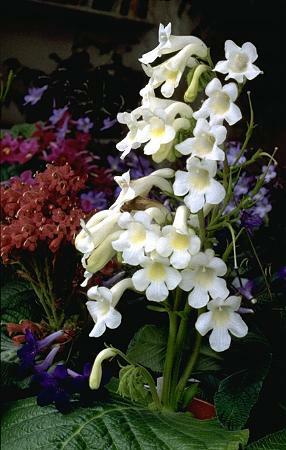 Moth-pollinated flowers are generally long- and narrow-tubed, white-, cream- or yellow-colored, and are strongly fragrant. Sinningia tubiflora is a striking example exhibiting this syndrome, and there seems to be little doubt that this species is moth-pollinated. The “key-hole flowers” of some Streptocarpus species (tube narrow, limb flat, tube entrance a small, laterally compressed hole) are probably visited by long-proboscid flies.